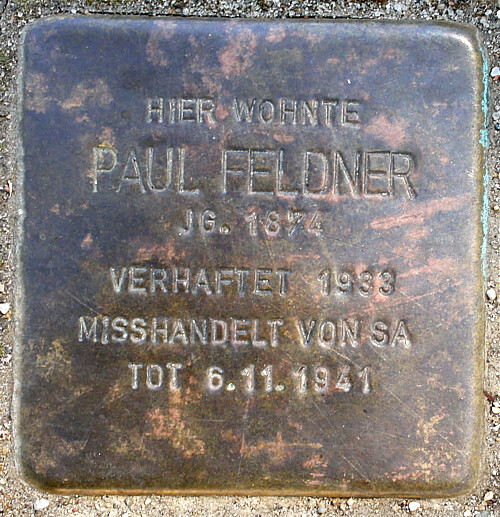 Paul Feldner (1874 – 1941) came from a family of agricultural workers and trained as a bricklayer in Frankfurt. He also ran a small pub, which quickly developed into a popular meeting place for organised workers. Highly regarded for his commitment and courageous manner, he was made, among other things, district manager of the city's public relief office after the First World War. Shortly after that, he became one of the founding members of Frankfurt's first housing cooperative for workers. After the National Socialists took power, the committed social democrat and trade unionist was arrested because of his political convictions and mistreated several times. He died of the consequences of the National Socialist terror.